A detail from the 'Wildfire' dress designed and created by Merlin Park College students Carolina Pokskrobko, Alika Vilenson, Viktorija Mikaite, Erika Ligeikaite. 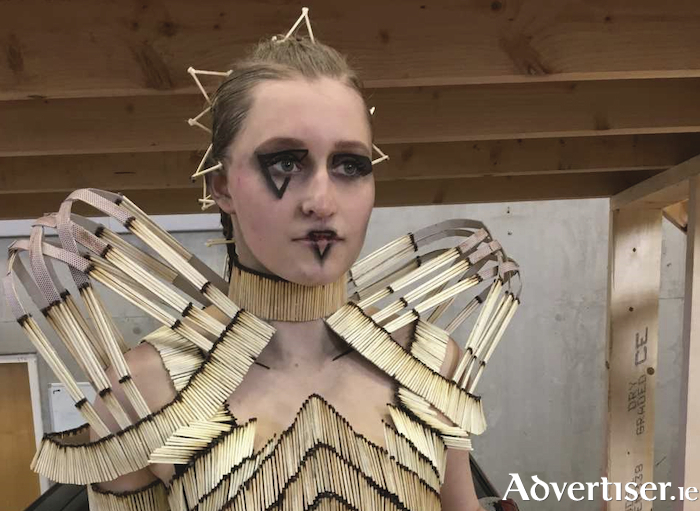 Transition year students from Merlin College have made it through to the regional finals of the prestigious Bank of Ireland Junk Kouture competition, with its entry ‘Wildfire’, inspired by the fires in the Cloosh Valley, Connemara. Junk Kouture encourages young designers in second level education to create couture designs and works of wearable art from everyday junk which would normally be discarded. Merlin College’s successful entry entitled ‘Wildfire’ was inspired by a fire in the Cloosh Valley. After watching an RTÉ news broadcast about the damage of these fires, students Carolina Pokskrobko, Alika Vilenson, Viktorija Mikaite, Erika Ligeikaite, were concerned about the dangers of fire and its effects, both socially and environmentally. The girls constructed their dress out of thousands of used matches. The design also looks at the chemical properties of the striking match and mathematics in its geometric structure and triangular theme. The cyclical nature of the matchstick was important in that matchs comes from trees but can also destroy trees. Carolina Poskrobko will model “Wildfire” in the Junk Kouture regional finals in the Helix, Dublin, on March 7. Page generated in 0.2038 seconds.